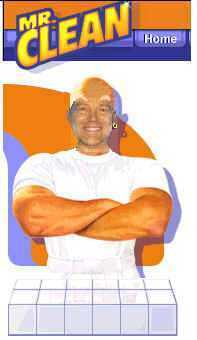 We can also clean up your ACT! 7.0 databases as a service. The United States Postal Service has developed certain standards: to promote efficient mail delivery. Basically this means going from specific to general, from the top down. The postal services processes your mail by reading from the bottom up. Your contact database may have these fields in the wrong order. You could spend hours of precious marketing time to cut and paste these fields in the right order. If you have thousands of contacts, this could be a full time job. Or, you can use the ACT! 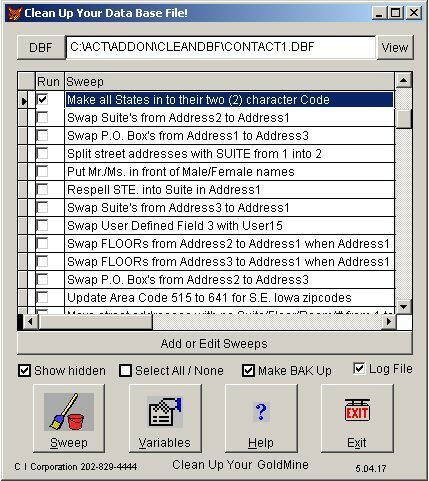 Sweep Address fixer to do the job in one swoop. Just launch the program, and in minutes your database address will be corrected. to clean up specific aspects of the address. Just click on the Check Box to Run a sweep. For example, one sweep would make the state codes two character capitalized letters. Another sweep would move the P.O. Box to be just above the city. Another sweep can correct an Area Code. Each sweep may take only a second for hundreds of records. You can customize your own sweeps. 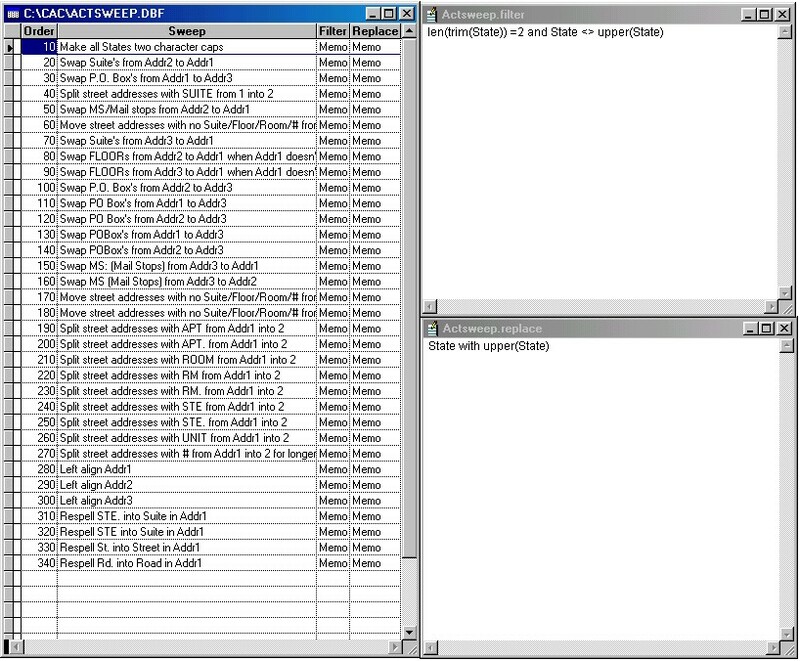 The program can make a Log File of the Before status of the DBF, and each even during processing. instead of in tedious, time-consuming, cutting and pasting. This is just one of the many Preferences you can specify, where the Addr3 field is closest to the City. You could also specify that it should be in Add2 or Addr1. It is fully customizable. ACT!Sweep! performs "sweeps" that make it unnecessary to buy other Add-Ons which only do a small part of what this product does. For example, you can pay hundreds for software that fixes Area Codes when they change. 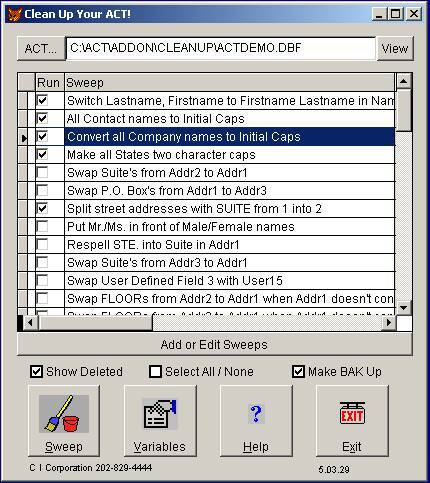 But this is just a simple "sweep" to replace one area code with another, that you can easily do with ACT!Sweep! Skip Skip the one record you see at the top. Do not replace. Leave as it is. and runs 10 times before prompting for payment. Quickly, saving you hours of work. We can also help you combine your various databases into one relational database in ACT! We can also convert your data from one format to another. See our matrix of possibilities.